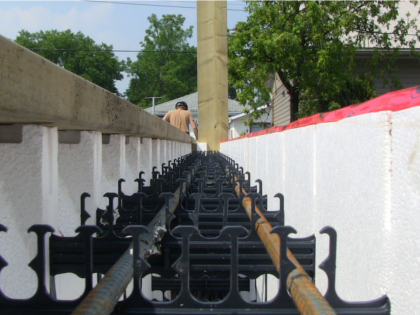 Insulated Concrete Forms give you the best living environment because you can easily build safer, more comfortable & environmentally friendlier homes and commercial buildings. 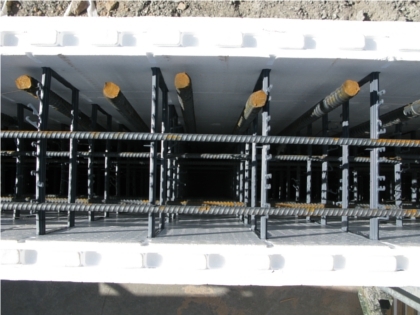 Fox Blocks form solid, reinforced concrete buildings and stay in place to provide superior insulation, space to run utilities, and backing for finishes. 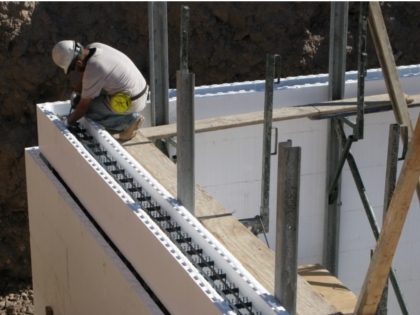 Fox Blocks is a pre-assembled panel system with an R-23 rating. The two main components are the 48″x16″ straight block and 60″x16″ corner reversible corner block. For example, the corner block can be used on the left or right side. There are several other specialty components that are made to speed up more complex installations, such as brick or stone ledges, t-walls, 45 degree corners, and radii. Fortunately, the price of the product is relatively lower compared to other pre-assembled systems because of the limited distance to the manufacturer thus saving fuel costs. A standard four-corner/eight foot tall wall will average about $4.00/sq. ft. of outside reveal. Feel free to call or email with a detailed plan to get a more accurate estimate. Also visit Fox Blocks Project Estimator to evaluate your own plans.